According to ComScore, over 49 million people in the US own smartphones, which is up 8.1% from three months prior. Check out paidcontent.org to get the full story. Now with the iPhone 4 out, and FroYo getting sent out on a more regular basis, it should be interesting to see how the numbers look in the next few months. What are your thoughts and predictions for the months ahead? Do you think that Microsoft is going to continue to drop fast? (Having lost the most points from the previous period.) 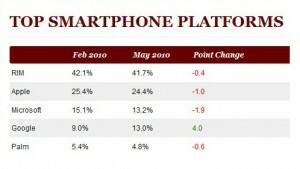 Did adding AppWorld help RIM lose less market share? Let us know what you think!